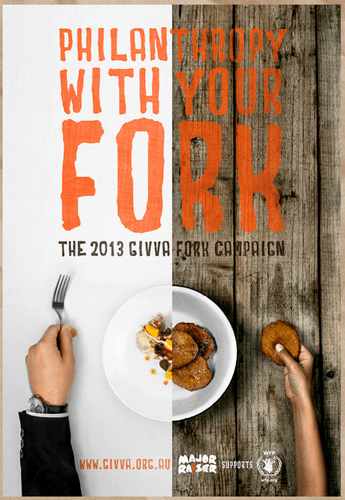 The Givva Fork promotion was created by Sydneysider Dominic Greenwood to raise money and awareness for the reputable World Food Programme, with this particular campaign focused on providing children in Laos with school meals. Every dollar raised for this program will provide four school meals to a child in need in Laos. 1. Pay an optional ‘forkage’ fee: Everyone knows of corkage - the fee you pay for the removal of a cork from your BYO alcohol. However ‘forkage’ is an optional fee you can pay to help the charity – a small donation made when paying your bill at the end of your meal. 2. Purchase a ‘Givva Fork’ for $6: each fork purchased provides a child in Laos with school meals for a month. The restaurant partners include: Orto Trading Co Surry Hills; Ampersand Surry Hills; Mad Pizza Surry Hills, Potts Point, Darlinghurst, Bondi Beach and Newtown; Olio St Leonards; Michelini Crows Nest; Not Bread Alone St Leonards; Ham Cronulla; The Dip at Goodgod and Edmonds and Greer Oatley. Masterchef finalist and ‘Have you Eaten’ cookbook author Billy Law has also signed on to be an ambassador for the campaign. The campaign will begin on March 1st and conclude on March 31st. To celebrate the end of the campaign Major Raiser will also be hosting a party at The Standard in Surry Hills featuring acts including Elizabeth Rose, Olympic Ayres, Polographia and a secret headliner.